Gans is an acronym and stands for Gas in a Nano-Solid State. For example, CO2 is a gas, we exhale it, it spews from our cars, our power plants, and it is causing global warming. GANS is atmospheric CO2 sequestered into a solid at normal room temperature and pressure – impressive! Normally, if you want to turn CO2 into a solid, we have to either freeze it (dry ice is frozen CO2) or we have to put it under very high pressure, both of which require a lot of energy to do so. If we want to turn CO2 into a solid at normal pressure and temperature, well then, we are going to need some serious magic – which is where Keshe comes into play. With Keshe’s new discovery, we can sequester atmospheric CO2, reverse global warming, and use this new GANS material to revolutionize the entire world! That’s what I’m talking about. Too bad it’s NOT real. If you like this article please see this one as well. Hello, don’t confuse yourself. the results are as anyone can expect. his Gans is ZnO not CO2 cause it’s white. CO2 Gans is cream. Here are both tests (XRD and XRF) which prove the material is not CO2 – even though I purchased the Keshe “CO2 collection kit”. You can say I did the experiment wrong all you want, you can say it should be cream and not white, and all I can say is prove it. I very badly wanted this story to be true, but, after following Keshe’s instructions to the letter, I basically made boogers and spent $1,150 in the process. IF in the end, I am wrong, I will be happy, until then, prove me wrong. Hi Josh. I am one of the keshe foundation students. You need to know more about the keshe reactor CO2. If result was white, then Your Gans is ZnO, if result was cream, then you produced CO2 Gans. as you can see, the picture is white and is CO2 Gans. for creating CO2 Gans, you have to put a copper nanocoated plate/wire (with caustic method, your nanocoate will be better) and a zink plate/wire and connect them to a LED (negative wire to nanocoated copper) and place them inside a solution of distilled water and sea salt. 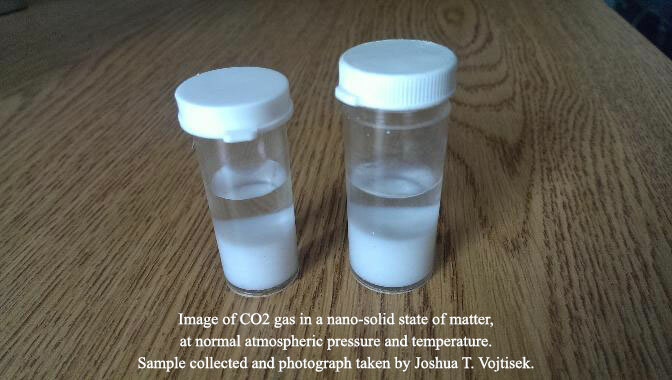 after some weeks, if you would have a good nanocoate, result will be a CO2 Gans. hope you to enjoy the knowledge. what Mr Keshe is done is XRD not XRF. You have to understand that XRF is not enough.